This salad was actually made for me by a good friend, and I became addicted ever since! I love the textures and burst of flavors in this salad! 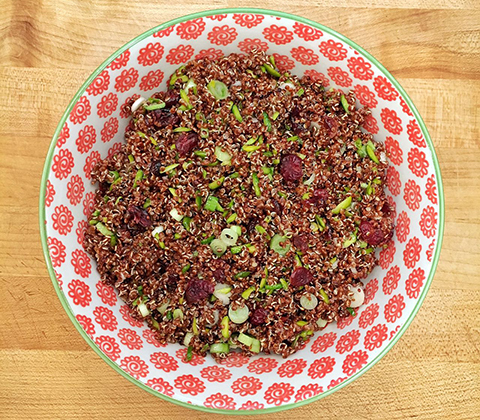 The crunchy pistachios, the chewy tartness of the cranberries, and the heartiness of the quinoa. To me it’s the perfect meal in itself. Quinoa is high in essential amino acids which help build protein. The pistachios provide a dose of heart healthy fat as well as B Complex vitamins. And the cranberries are a great source of Vitamin C, good for boosting immunity and also skin health. Trust me, once you try this salad, there’s no going back. * Cook the quinoa in boiling salted water, then fluff with a fork and set aside to cool. * Whisk the dressing ingredients together and set aside. * Combine the quinoa, cranberries, pistachios and spring onions in a bowl. * Pour over the dressing and mix well. * You can enjoy it straight away or store it in the fridge until you are ready to eat it. The longer it sits in the fridge the more the flavors will marry and the better it will taste.